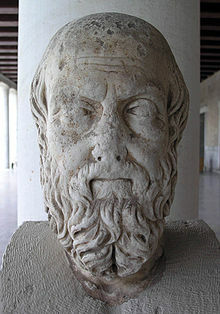 Herodotus, later famous as a historian to the point of becoming known by his admirers as the 'father of history', was born in Halicarnassus, (now Bodrum, Turkey), in about 484 B. C.
As a son of a prominent family Herodotus received a good education sufficient to allow him to eventually gain an extensive familiarity with the literature of ancient Greece. He seems to have travelled very extensively in the Greek and Persian worlds into which he had been born. The inhabited world as known of by Herodotus. On this map the Mediterranean Sea can be discerned as a large inlet, with landmasses to the north and south, and with a western entry point labelled Pillars, (from the Greek designation ~ 'the Pillars of Hercules'). Today's Italian peninsula can be easily seen with mainland Greece being located to its right and with today's Turkey, (or Asia Minor), being furthur right again. In Herodotus day Halicarnassus was an "Ionian" Greek colonial town subject to Persian overlordship and located at the bottom left of Asia Minor. When he was in his early thirties (circa 457 BC) some political difficulties between Herodotus' wider family and the rulers of Halicarnassus contributed to his living in exile for several years. During these times his initial destination seems to have been the the island of Samos but thereafter Herodotus traveled widely throughout virtually the entire ancient Middle East visiting Asia Minor, Babylonia, Egypt, and Greece. Herodotus was centrally involved in the rebellious overthrow of the unpopular ruler of Halicarnassus and was thereby enabled to enjoy full rights of citizenship in his home city. He did not settle down there however but, circa 447 BC, went to Athens, then the center and focus of culture in the Greek world, where he won the admiration of the most illustrious men of Greece, including the great Athenian statesman Pericles. During a stay of some years in Athens Herodotus seems to have been awarded a substantial sum, by a decree of the people, in appreciation of his literary talents. Herodotus did not enjoy the status of citizenship, with associated enhancements in rights, in Athens and this may have contributed to his joining in (443 BC) with a new colonial settlement at Thurii in southern Italy where he could hope to be a citizen. Such colonies were widely sponsored by individual greek city states for commercial reasons and also to better provide for the employment of their citizens. Herodotus settled down in Thurii and devoted his efforts to the completion of a great work entitled 'Inquiry' ( a Greek word which passed into Latin and took on its modern meaning as History ). Herodotus' wide-ranging work has subsequently been presented by scholars as a nine part work the first six 'books' of which are introductory and give rounded introductions to most of the peoples of the ancient world giving insights into their customs, legends, history, and traditions. The last three 'books' treat with the rivalries and conflicts between the Greek and Persian worlds from the early fifth century B. C.
In the several sections of The Histories, Herodotus describes the expansion of the Persian Achaemenid empire under several of its kings including Cyrus the Great (557-530 BC: Book1), Cambyses (530-522 BC: Book 2 and part of Book 3) and Darius I the Great (521-486 BC: the rest of Book 3 then Books 4,5,6), culminating in king Xerxes' (486-479 BC: Books 7, 8, 9) expedition in 480 BCE against the Greeks, which met with disaster in the naval engagement at Salamis and the land battles at Plataea and Mycale. Herodotus' work presents the development of civilization as moving inexorably toward a great confrontation between Persia and Greece, which are presented as the centers, respectively, of Eastern and Western culture. Herodotus of Halicarnassus hereby publishes the results of his inquiries, hoping to do two things: to preserve the memory of the past by putting on record the astonishing achievements both of the Greek and the non-Greek peoples; and more particularly, to show how the two races came into conflict. In preparing his History Herodotus' sources of information include the works of predecessors, but these are widely complemented through the knowledge that he gained from his own extensive travels. Although Herodotus' great work does in fact contain some factual inaccuracies, he does seem to have striven for accuracy. The entire work being an ambitious attempt to present the historical context of the Greek rivalry with Persia. Herotus' Histories is rendered particularly appealing by such admirable qualities as the fullness with which Herodotus conveys his subject and the beauty of expression that he is able to impart to the Ionic dialect in which it is composed. The whole being a grandly concieved narrative with appropriate episodic diversions that manage to elucidate the main theme without seeming to interrupt its flow. "wrote as it is natural that he should write. He wrote for a nation susceptible, curious, lively, insatiably desirous of novelty and excitement." Herodotus believed that the universe is ruled by Fate and Chance, and that nothing is stable in human affairs. Moral choice is still important, however, since arrogance (Hubris) brings down upon itself the retribution of the gods (Nemesis). Herodotus' effective attempt to draw moral lessons from the study of great events formed the basis of the Greek and Roman historiographical tradition which he is held to have established. Herodotus died in 425 B. C.
Several pages on our site, treating with aspects of nineteenth century European history, have been favored with some degree of popularity, rank highly in some search engines, and receive many visitors.